Adjust oven racks to lower and middle positions; heat oven to 350 degrees. FOR FILLING: Gently toss peaches and sugar together in large bowl; let stand for 30 minutes, tossing several times. Drain peaches in colander set over large bowl. Whisk 1/4 cup drained peach juice, cornstarch, lemon juice, salt, cinnamon, and nutmeg together in small bowl; discard excess peach juice*. Toss juice mixture with peaches and transfer to 8-inch-square or 9 inch greased pie plate. 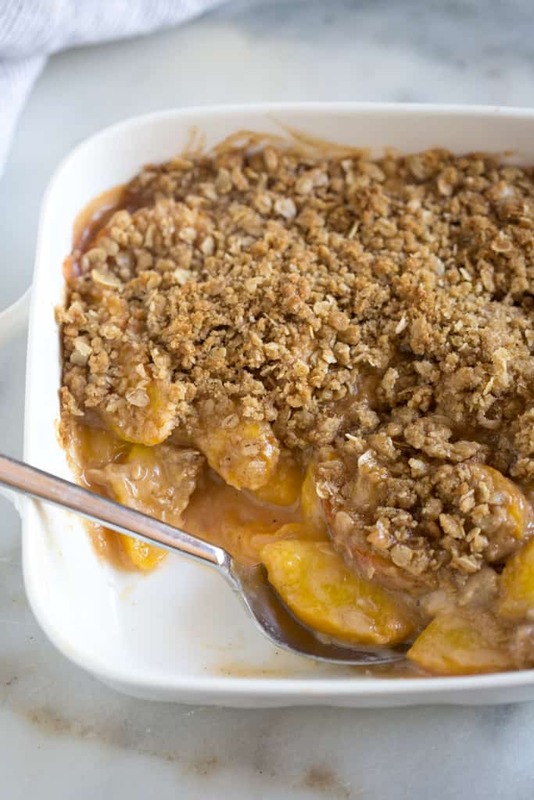 TOPPING: While peaches are draining, combine flour, sugars (reserving 1 tablespoon granulated sugar), and salt in work bowl of food processor; drizzle vanilla over top. Pulse to combine mixture. Add butter and half of nuts; process until mixture clumps together about 30 seconds, pausing halfway through to scrape down sides of work bowl. Sprinkle remaining nuts over mixture and combine. Transfer mixture to parchment-lined baking sheet and spread into even layer. Bake on middle rack until lightly browned and firm, 18 to 22 minutes. Remove from oven and break into chunks. Set aside. You can do this early in the day or the day before and store in a sealed bag or plastic container until ready to use. 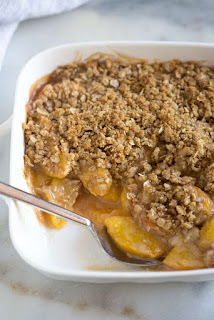 TO ASSEMBLE AND BAKE: Grasping edges of parchment paper, slide topping over peaches or scoop up by handfuls and distribute over peaches, breaking up any large pieces. Sprinkle remaining tablespoon sugar over top and place on lower oven rack. Increase oven temperature to 375 degrees and bake until well browned and fruit is bubbling around edges, 25 to 35 minutes. Serve warm with vanilla ice cream or whipping cream.